Blurb: Claudia Emerson has a good friend who shares the same first name and last name. That friend unfortunately dies in a tragic accident during homecoming dance. 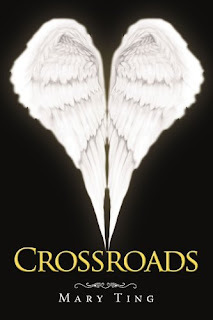 Claudia is distraught at the loss of her friend, but is even more disturbed by her dreams, which seem to take her to another place called Crossroads. Unknown to her, Crossroads is like a second heaven, a place between heaven and earth. It is where the souls of humans in comas or near death experiences may wander. Where, Claudia meets Michael, a nephilim, a half angel, half human, whom she often meets in her dreams. It turns out that this isn’t her first visit to Crossroads, which is an enigma for no human can ever travel there until Claudia. My review: The amount of books featuring angels has grown tremendously this year and I have read many out there. The last three I read and loved have all been refreshingly and truly unique: the adult Fierce Dawn by Amber Scott and the young adult novels, Angel Burn by L.A. Weatherly and Mary Ting's Crossroads. In each novel, the author has successfully created new worlds and mythology and paired them with a cast of equally vibrant characters. In my mind it's these factors which have made these books unforgettable. Crossroads is purely Claudia's tale. She's a down to earth seventeen year old with the ability to dream about a specific place. This place is called the Crossroads, and as she speaks to a man, Philip, he informs her humans cannot travel there. But Claudia has, more than once, so what does that say about her? As her story progresses, she learns the inhabitants of the Crossroads are angels and their world is an intricate one with a diverse history and varied groupings. Now that other supernatural creatures know about Claudia's talent to travel, her new angel friends realize she must be protected. Can they keep her safe, especially when one of them has fallen for her? Ting's angel lore intrigued me. I really liked the classifications of angels and the theories which comprise the Twelve Angels and their Divine Commandments, the Royal Council, and the alkins/the fallen. I also enjoyed the world building and Halo City (the name alone should sound corny, but from the way the author describes it I found the city an amazing place of wonder. Another part of the story I grew to cherish was the pace. Claudia's life moves languidly--like real time--which gave the story realism. I became fully engrossed in her world and that of the angels. What an amazing cast! Michael, the alkin Claudia falls in love with, was totally lovable and unabashedly romantic with his surprise picnics, gifts of flowers, treks to waterfalls and flying. No wonder Claudia falls head over heels for him, wouldn't you? My other favorite character was Micheal's friend and trusted sidekick, Davin. He was also charming and I loved his sense of humor. All of Michael's group of winged associates grew on me and over the pages they became more like friends. The birthday party scene helped establish their unique personalities, not to mention endearing from their often humorous ways of looking at human goods. I guess being so enmeshed in the story helped me pick up on some other things. I did wish Claudia and Michael's falling in love hadn't seemed so rushed. There were a few times I felt Claudia sounded older--in particular her use of cliches (it could have been mentioned she picked them up from her Gamma since they had such a special relationship) or occasional stilted manner of description, "I cringed my eyes"). Certain words did become repetitive and there were also a few spots where things seemed over-explained. Since I was already wrapped up in Claudia's story, these instances didn't detract from what kept me reading: unique mythology and engaging characters. I liked Claudia and Michael. Over all, I found Crossroads enchanting--a sweet story of wonder and understanding, complete with a heart-stirring romance--and await the continuation of Claudia's tale. Cover comment: White wings up against a black background. Looks simplistic but after reading the story, this image certainly takes on new meaning. Book source: Received from author for my honest review.